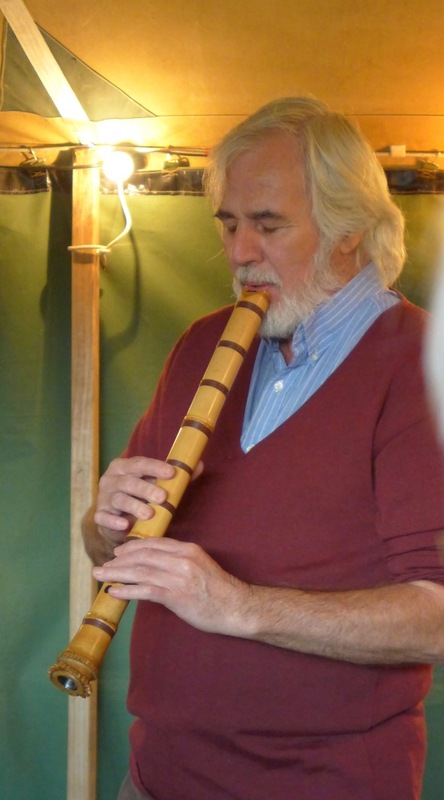 Tarchin turned 70 this year – not a particularly remarkable milestone when most of us these days can expect to live well into our nineties. But there was an extra poignancy to this one, given that Tarchin and his body have been dancing with cancer for the last four years. 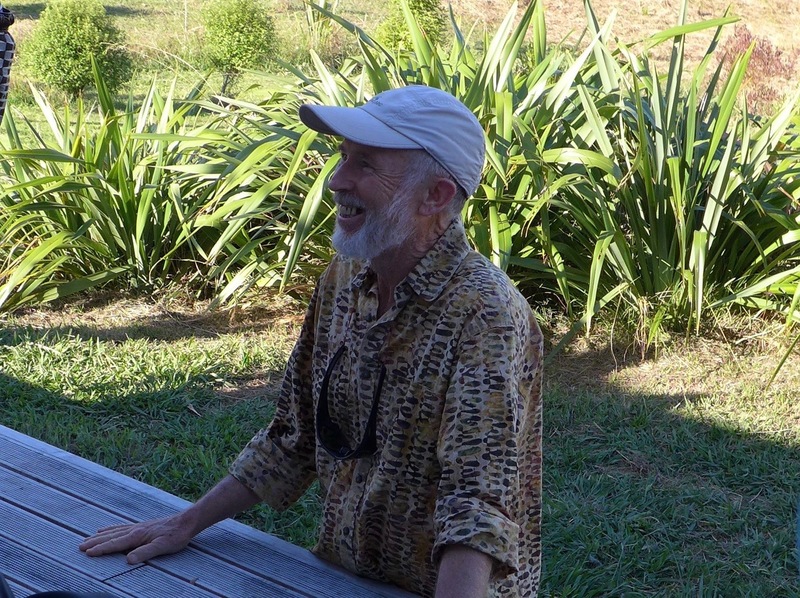 So, on the 2nd and 3rd of March more than seventy friends and sangha from, New Zealand, Australia, England, America, Canada, Brazil and France, all gathered on the Whispering Stream property to celebrate. Tarchin’s birthday dovetailed with dedicating the Manaaki cabins, built to at Whispering Stream, to support the Orgyen Care Project. For those who don’t know, Orgyen Hermitage is Tarchin and Mary’s home near Katikati and Whispering Stream belongs to dedicated Dharma couple Tash and Grant Rix. The Whispering Stream property, snuggles into the foothills of the Kaimai ranges, sloping toward a panorama of sky, sea and land. Just to stand there unlocks peaceful, mindful presence. 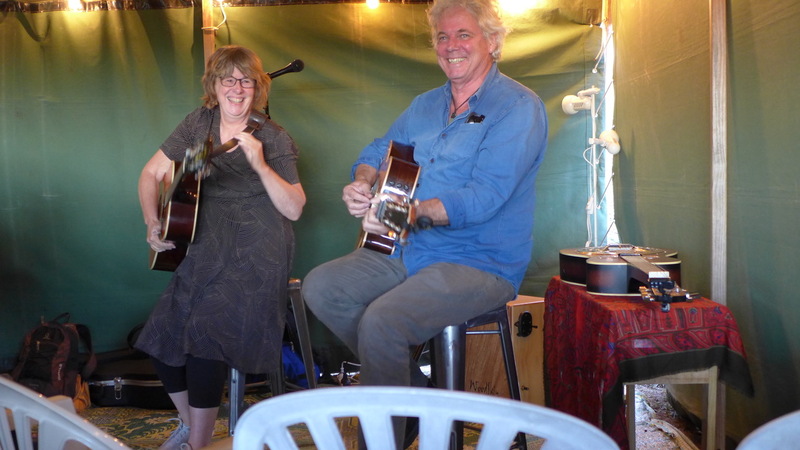 People arrived at 4pm to look over the new cabins, then gathered in the shade of a marquee at the top of the property where Grant, Tash and Andy McIntosh spoke about the vision and experience of the Orgyen Care Project and its benefits for Tarchin and Mary. When Tarchin became ill, questions about how he and Mary would be able to manage their land as they grew older (and possibly sicker) leapt from the back many caring minds and landed, with a thump, right at the front. So an idea was quietly hatched and developed into a plan. Accommodation for Andy would be built at Whispering Stream. The wider community would support him to live there while he’d undertake the care of the land at Orgyen Hermitage (and it’s residents). When they got to the part in the story about running the plan by Tarchin for his approval, Grant and Andy glanced at each other with what I interpreted as a, ‘Yeah! Like that was going to work!’ look, chuckled and said they decided a pronouncement would work better. 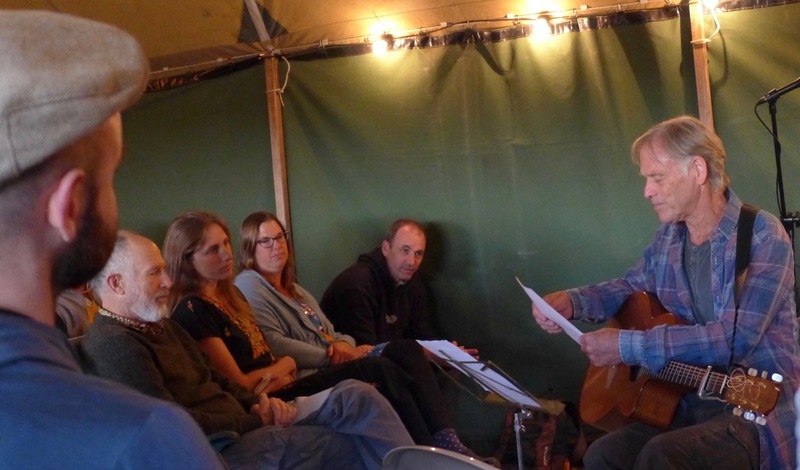 After the ceremony, the marquee reinvented itself as a pop-up concert chamber and we all shared poetry, music, chanting, laughter and song. Instruments included Kelvin’s Takahashi flute, percussion, guitars, and a harmonium. A lovely close to a beautiful day. The next morning, Sunday, dawned as bright and clear as the day before. 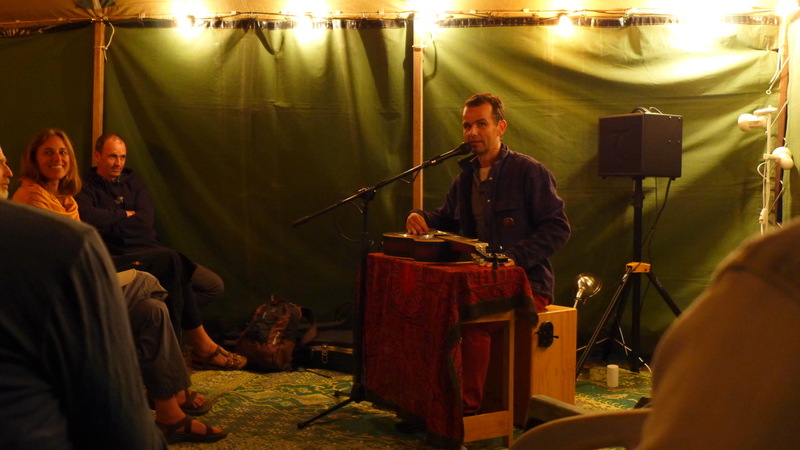 Tarchin gave a beautiful class on Gratitude in the Whispering Stream forest then, the marquee now having been transformed into a dining hall, everyone shared a sumptuous and wildly tasty potluck lunch. 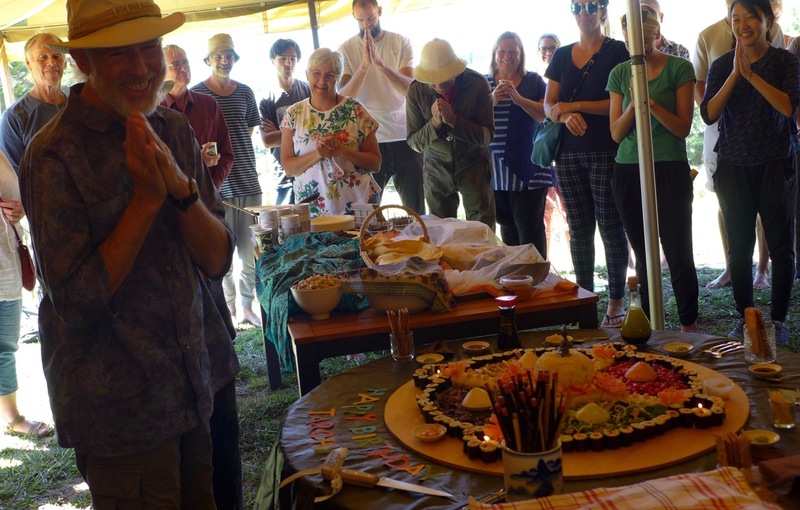 But first Tarchin had to cut the amazing mandala birthday cake. More than a metre in diameter, the ‘cake’ accurately represented all the details of a mandala of the elements. Each quarter glowed in a different colour. Patterns closely resembled the colourful sand mandalas Tibetan monks take days to produce. Tiny tormas adorned specific positions. And, if that care and attention to detail weren’t enough, every single element of the incredible composition was not only edible but also healthy! In a word, not just for the cake, but for the whole weekend … Wow!